You may filter which advisories to display by year, month, and day. On Saturday rain fell up to 10,000’ with more than 1” of water in the Bridger Range and up to 0.5” near Big Sky and Cooke City. Sunday morning temperatures dropped to low 30s F and the mountains received 3-5” of snow. This morning temperatures are high 20s F and wind has been easterly at 5-15 mph. Today temperatures will reach 40s F under clearing skies, and wind will shift westerly at 5-10 mph. Through the next week daytime high temperatures will be near 50 F with overnight lows near 30 F, and wind will be westerly at 10-20 mph with gusts to 30 mph. Expect mostly clear, dry weather with increased cloud cover Wednesday through the second half of the week. Cooler, wet weather is expected next weekend. The mountains received 4-6” of snow Monday through Wednesday with westerly wind at 20-40 mph Wednesday evening. Yesterday temperatures reached high 40s to 50s F under clear skies. This morning under partly cloudy skies temperatures are mid-30s to mid-40s F, and wind is west-northwest at 15-25 mph. Today will be mostly sunny with temperatures in the high 40s to 50s F and westerly wind at 15-25 mph. Clouds will increase overnight with temperatures in the 30s F, and there is a chance for precipitation Saturday afternoon. Early Sunday scattered rain showers will turn to snow with temperatures in the high 20s to low 30s F, and wind will shift easterly at 20-30 mph. By Monday 3-6” of new snow is possible in the mountains. Since Friday the mountains received 8-11” of dense snow (0.8-1.3” of Snow Water Equivalent) near Big Sky, Bozeman and West Yellowstone, and 14” (1.6” of SWE) near Cooke City. This morning temperatures are high 20s to low 30s F and wind is northwest at 15-30 mph. Today will be mostly cloudy with temperatures reach 40 F. Winds will be southwest at wind at 15-30 mph. Snow showers are likely with accumulations of 1-2” today. Another round of snowfall is expected Tuesday afternoon into Wednesday. The end of the week will be dry and warm. Since Wednesday the mountains received 4-6” of snow near Big Sky and the Bridger Range, 10” in Hyalite, 1” near Cooke City and zero near West Yellowstone. This morning temperatures are teens to low 20s F and wind is northwest at 10-20 mph. Today temperatures will reach mid-30s F with northerly wind at 5-15 mph. Scattered snow showers are likely with minimal accumulation today. Tomorrow will be partly sunny with increasing clouds into Sunday. This weekend temperatures will reach mid-30s F with overnight lows in the 20s F, and wind will shift west-southwest at 10-20 mph. Snow is expected Late Sunday with 2-4” possible by Monday morning. Since yesterday morning the mountains around Bozeman and Big Sky picked up 8-12” of high density snow. The mountains around West Yellowstone and Cooke City picked up 4-8”. Reports from Cooke City indicate snow totals are likely much higher above 9,000’. At 5 a.m., temperatures range from the upper teens to mid-20s F and winds are blowing 10-20 mph out of the west-northwest. Cloudy skies and light snow showers are likely this morning with an additional 1-2” of snow possible by this afternoon. Snow lets up later in the day and skies become partly to mostly cloudy. Temps warm to the upper 20s to low 30s and winds remain light to moderate out of the west-northwest. Lows tonight drop well below freezing and no significant accumulation is expected over the next 24 hours. There is a chance the sun will poke out tomorrow increasing the possibility of wet snow avalanches. Since yesterday the snow line has been around 8,000’ and the mountains received 0.5 to 1.2” of water. This equals up to one foot of snow at higher elevations (snow water equivalent). The highest amounts are near Cooke City and the Bridger Range (1.0-1.2” SWE). Elsewhere got about half (0.5-0.7” SWE). Yesterday wind was 30-55 mph out of the southwest to west with temperatures in the 30s F.
Today temperatures will remain in the 30s F, and by Wednesday temperatures will cool to highs in the 20s F and lows in the teens F. Today and tomorrow wind will be 20-30 mph out of the west to southwest, and wind will shift north-northwest late Tuesday and Wednesday. Heavy precipitation will continue Tuesday through Wednesday and the snow level will drop from around 8,000’ to near 6,500’ as temperatures cool later in the week. Higher elevations are likely to receive 2-3 feet of snow by Thursday morning. 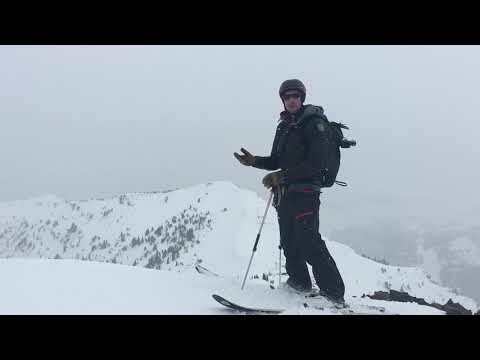 Wind and precipitation, whether rain or snow, create heightened avalanche conditions. 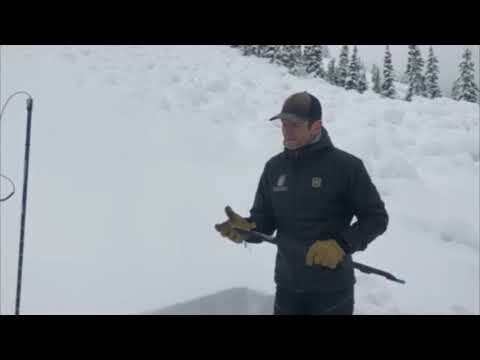 The storm just began yesterday and skiers triggered small slab avalanches in Beehive (details) and near Cooke City (details). 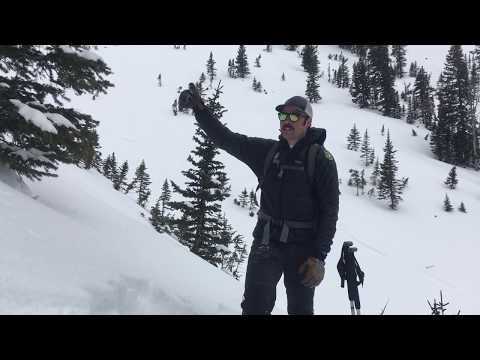 Avalanches will grow in size and likelihood as more snow and rain falls. 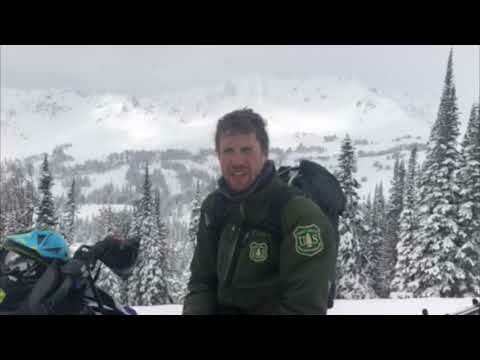 Dangerous avalanche conditions will develop today and through the week. Be conservative. Avoid steep slopes and be cautious of travel underneath steep slopes. See below for general spring travel advice. 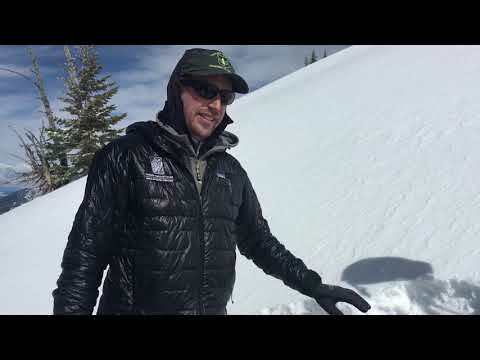 We will update our weather and avalanche log daily through April. 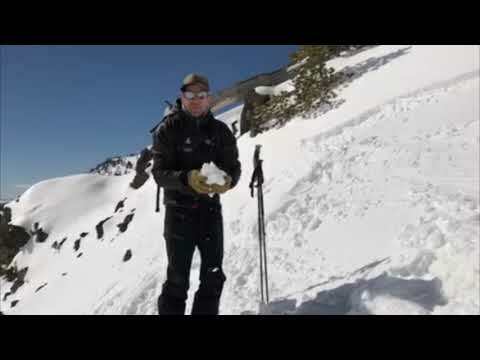 It is a valuable resource for backcountry travelers through winter and spring. 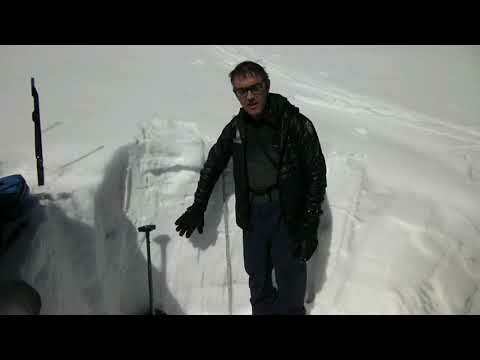 If you have any avalanche observations, please share them with us to include in this database. Contact us via our website, email (mtavalanche@gmail.com), phone (406-587-6984), or Instagram (#gnfacobs). Since yesterday morning scattered snow showers delivered 1-2” of snow to the mountains. Yesterday temperatures reached 30s to low 40s F, and this morning temperatures are high 20s to low 30s F. Overnight, southwest wind increased to 20-30 mph with gusts of 45-55 mph. Today wind will remain strong at 30-50 mph out of the southwest-west. Temperatures will reach high 30s to low 40s F with light snow this morning, possible rain this afternoon and a mix of precipitation this evening. By morning, 1-2” of new snow is possible at higher elevations with 4-6” possible near Cooke City. Freezing line fluctuated between 7,500-8,500 feet, the elevation of many weather stations making snowfall amounts difficult to determine. It is estimated that 3” fell in the Bridger Range, 1” at Big Sky and 5” around Taylor Fork, West Yellowstone and Cooke City. Winds are west to southwest at 15-25 mph with mountain temperatures of 25-33F. This morning a passing front will bring drizzle to the low elevations and 1-2” of snow up high. Skies will clear this afternoon and temperatures will rise to 40F. Since yesterday morning the mountains around West Yellowstone and Cooke City picked up a few inches of snow at upper elevations and rain down low. The rest of the forecast area saw a trace of snow above 8,000 ft. and light rain at lower elevations. This morning, temps range from the upper 20s to low 30s F under partly to mostly cloudy skies. Winds are blowing 5-20 mph out of the west-southwest. Today, temps warm into the 40s and winds remain light to moderate out of the west-southwest. Increasing precipitation this afternoon will deliver light rain below 8,000 ft. and 1-2” of snow up high. Warm and wet conditions continue through tomorrow. Overnight the mountains near Big Sky received 2-4” of snow while the rest of the forecast area picked up a trace to one inch. This morning, snow has stopped and temperatures are in the 20s to low 30s F. Winds are blowing 15-30 mph out of the west-southwest. Today, temps warm into the upper 30s to low 40s F under partly to mostly cloudy skies. Winds continue to blow 15-30 mph out of the west-southwest. The mountains could see a trace to one inch of snow by tomorrow morning.